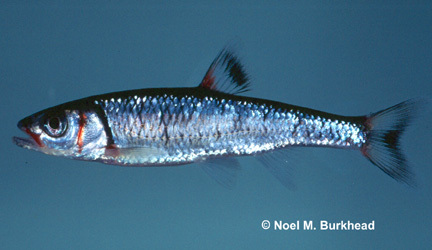 Identification: Gilbert (1964); Page and Burr (1991); Etnier and Starnes (1993); Jenkins and Burkhead (1994); another commonly used name is Notropis coccogenis. Table 1. States with nonindigenous occurrences, the earliest and latest observations in each state, and the tally and names of HUCs with observations†. Names and dates are hyperlinked to their relevant specimen records. The list of references for all nonindigenous occurrences of Luxilus coccogenis are found here. Status: Established in Santee drainage, South Carolina; reported, possibly established in the New River drainage, North Carolina; reported from the New River drainage in Virginia. Remarks: Stauffer et al. (1995) listed this species as "present; probably introduced" in the Kanawha River drainage above the falls (i.e., the New River drainage), but they indicated that the shiner has never been recorded in West Virginia. Rohde, F. C., R. G. Arndt, J. W. Foltz, and J. M. Quattro. 2009. Freshwater Fishes of South Carolin. University of South Carolina Press, Columbia, SC. 430 pp.